After two weeks without posting there is so much to write about I hardly know how to start. 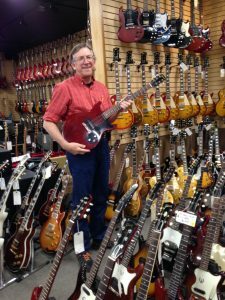 I’m going to talk about my visit to Norman’s Rare Guitars in Tarzana last week. Sepi and I went to Southern California to visit family and friends. That’s another story. I happened to see a little video thing by a guy named Mark at Norman’s a few weeks ago and thought it would time to see if my 1989 Telecaster Custom shop had any value. 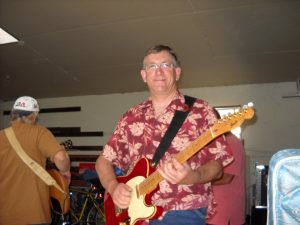 Here’s a picture of me playing it at Vince’s in 2011. That’s Franco playing my Washburn bass in the background. Here’s his story. 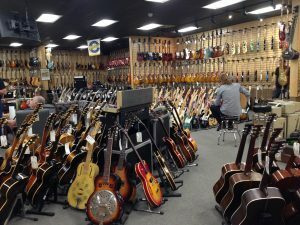 I was prepared for a big guitar store, but Sepi was gobsmacked. She took about a hundred pictures. Here’s a view of part of the store. 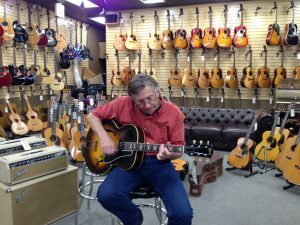 It didn’t take long for the expert at Norman’s (Mark) to tell me the Tele was worth about what I paid for it. Of course I would have to give a significant discount if he were to buy it for the store. I’ll hang onto it . . .
Well, naturally, as long as I was here I was going to look around. 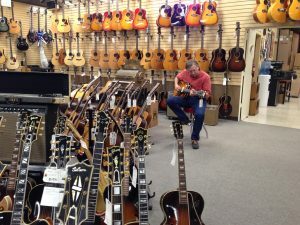 The first thing I spotted was an Epiphone Century just like Peter’s except in better condition. 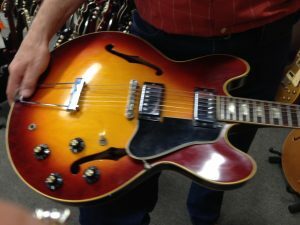 Then I looked for an example of the late ’60’s ES-335 I used to own. Yep, they had one. Now I’m thinking of other guitars I used to own. 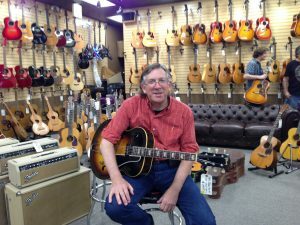 My high school friend Bruce Johnson sold me a Gibson Melody Maker that I used for a while. No pictures of this exist and even my memory is a little cloudy but I’m pretty sure it looked like this. None of these guitars spoke to me now. I was thinking of leaving and took one more turn around the shop. There were some archtops I hadn’t noticed before. 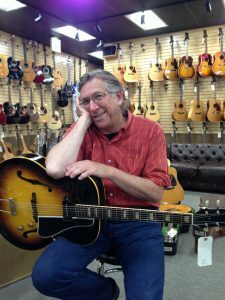 One was a Gibson ES-150 from the early 1950’s. Looked, played, and sounded very nice. Sepi suggested that if I liked it more that the Tele, I could work a trade. Aieee! I hadn’t thought of that. I called Mark over and he said I needed to talk to Norman who was busy at the moment. More agonizing while Sepi encouraged me. I already had a very similar guitar although not a vintage Gibson. What a dilemma! In the end I decided to let it go. I think I can sell the Tele myself for a lot more. I don’t want to be a guitar collector, just a guitar player. Time to go practice! Rather an opaque title for most people. 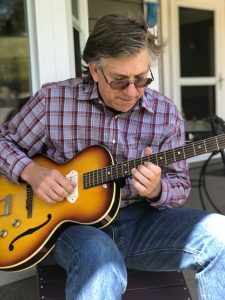 It refers to the brand and model of the guitar I am playing in this photo. Sepi took the picture on the front porch of Peter and Nanci’s home in Spokane last Friday. The guitar is Peter’s. When, after Peter’s stroke, I visited them for the first time, I saw this guitar on a stand in their living room. I couldn’t believe it! It was the first real guitar I had owned! I learned to play on it! I had sold it to Peter years ago and forgotten all about it. In subsequent visits I cleaned it up and did some other work on it. It plays great but sadly, Peter can no longer play guitar. I play it when I’m there but I suspect that’s the only time anyone plays it. Last fall I asked Nanci if I could buy it from them. She said Peter really liked the guitar and didn’t want to let it go. She did say she told her daughters that I was to have it after their passing. I really don’t need any more guitars but it would complete a circle. It will always be Peters’ guitar though.